How to Wear a Scarf: A Guide for MenAn illustrated guide for those who just don’t know how. What’s the Best Women’s Scarf to Give?We sifted through the nominations and found a winner from Barcelona. Now’s the Time to Stock Up on Hats, Gloves, and ScarvesCashmere on sale! 22 Scarves Under $150 That Will Arrive in Time for ChristmasIncluding Acne, A.P.C., and Canada Goose items. The Perfect Winter 2017 Accessory Is This Giant ScarfHide away forever. Maggie Gyllenhaal Doesn’t Know Anything About Taylor Swift’s ScarfThe scarf from “All Too Well” remains unaccounted for. Hermès Created a Laundromat Where They’ll Dye Silk ScarvesThese are the chicest washing machines ever. How to Stay Warm and Dry During a BlizzardHint: You can get most of what you’ll need on Amazon. Ivanka Trump–Branded Scarves Are a Fire RiskTwenty thousand of the scarves have been recalled. Treat Yourself Friday: A Botanical Faux-Fur ScarfFlower power. A Chic Hermès Scarf for a Good CauseIt benefits Panthera, a conservation initiative devoted to big cats. A Big Scarf to Protect Against Aggressive Air-ConditioningOr take it to the beach. Swap Your Necklace for This Colorful ScarfTake a cue from the street-style set. A Soft, Colorful Scarf to Get You Through WinterWind chill has nothing on this. Why Don’t You Guys Know How to Wear Scarves?The most-Googled fashion questions of 2014 are … foolish. Street Style: New York Dresses for Mixed TemperaturesBlanket coats, orange leather gloves, biker jackets, and more chic winter layers. 16 Ways to Wear a Cozy Blanket Scarf This FallChicer than a Snuggie. Hermès Bandit Bandanas: For the Stylish CowgirlAnd for less than $200! Secrets of the Scarf: Parisians Show Off Their Tying ProwessHow to sport them (almost everywhere). Spring’s 22 Best Printed Scarves Under $100Tie one on. Best of the Week’s Style Blogs: Chunky ScarvesIt’s all in how you wrap it. 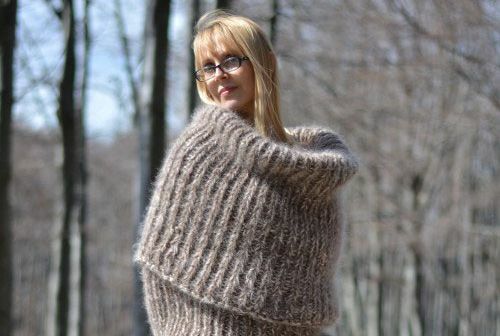 The 17 Chunkiest Knit ScarvesYou’ll never feel the draft again. 25 Lightweight Scarves for Cool Fall MorningsThe perfect accompaniment to your sweater. Fall Dressing: Try a Surreal Printed Scarf With a Whimsical BlazerWrap it around your hips instead of your neck. Best Bet: Cullen Meyer’s Procession ScarfA whimsical scarf starring animal-human hybrids. Best Bet: Marc by Marc Jacobs Checked ScarfTie one on. Best Bet: ModCloth’s Geometric ScarfBe ready for transitional weather with this geometric scarf. Keep Warm: Fifteen Accessories for a Chic WinterHats, gloves, scarves, and more to keep the frost at bay. Twenty-five Offbeat Scarves for an Upbeat FallLoop, tie, and wrap them to transform your look. Best Bet: Luxirare Leather ScarfSkip the classic wool for a change. 24-Hour Wardrobe: How to Layer Like Taylor Tomasi HillTake her mix-and-match aesthetic for a spin. Exclusive: Smash Says Good-bye to Debra Messing’s Terrible ScarvesNew showrunner Joshua Safran knows where his priorities are. Design Hunting: Bernd Goeckler’s Treasures, Deborah Needleman on the GoShopping on the go with Deborah Needleman, Helena Rubenstein’s glorious acrylic bed, the intriguing pieces at Bernd Goeckler, and more. Liam Gallagher Has a History of Feminine ScarvesSee a look back at this burgeoning fashion designer’s most memorable sartorial moments. Paris Men Are Fit to Be TiedThe season’s hottest accessory? Scarves. And lots of them! White Zombie’s Sean Yseult Has Moved Onto Fifth AvenueWe sat down with the bassist to find out how exactly she made the move from Zombie to scarf designer. Ron Artest Puts Out Oddly Legit Mix TapeThe Houston Rockets forward has teamed with some reputable D.J.’s, and we fear his work may be relevant. New Paris Shows: Comme des Garçons, Jean Paul Gaultier, Karl Lagerfeld, and More!See the new spring 2009 collections from Paris Fashion Week. Stock at the Hermès Sale Still ExpensiveBoots are $700, a skirt is $500, and a white button-down shirt is $1,050. But that’s a lot less than they used to be. Heavens! Has Marc Ripped Off the Swedes? !In the fifties, in the sleepy town in northern Sweden of Härjedalen, Gosta Olofsson produced about 1,000 scarves to celebrate this fair city. The scarves portrayed a small church, wooden huts, bears, flowers, and the coat of arms of Härjedalen. Cute! Now flash-forward to spring/summer ‘08: Marc Jacobs produces remarkably similar “mountain” bandannas to, um, celebrate the sleepy northern Swedish village of Härjedalen? Serge Becker: Drug-Dealing ‘Consultant’ Is Not a Co-Owner of theGuest of a Guest broke the story yesterday that Cordell Lochin — thought be a partner in Serge Becker’s joints La Esquina, 205, and the Box — will be sentenced on October 10 for importing more than 100 kilos of weed and dealing it in New York in 2004 and 2005. There’s been speculation that the August 24 raid of the Box and La Esquina was related to this, and we’ve heard rumors that Cordell was recently arrested again — but the Box’s publicist, Nadine Johnson, tells us neither of these things are correct (a check with NYPD turned up no recent arrests). She also describes Cordell as a consultant and not a partner in the Box, as reported in a recent Observer profile and other places: “We had taken the decision to call him a partner, but he isn’t a real partner or employee for the Box or La Esquina.” Serge Becker did not know about Cordell’s past until ten days ago, when his case went to trial, Johnson says. She also issued an emphatic statement to Grub Street on behalf of Becker further disavowing Cordell’s ownership stake. On the Firing Line In a week when much of the world came to midtown, the boldest names were to be found on campus. Hillary Clinton held up under heavy grilling at the Dartmouth debates, while Columbia University president Lee Bollinger invited Iranian leader Mahmoud Ahmadinejad uptown, then called him a “petty and cruel dictator.” (For his part, Ahmadinejad denied that his country contained such dangerous American inventions as nuclear weapons and homosexuals.) Potential First Husband Bill was joined at his Global Initiative conference by poverty experts Brad Pitt and Angelina Jolie. The former commander-in-chief also declared war, unsuccessfully, on Village eatery Osso Buco for hanging a promotional photo of daughter Chelsea in its front window. Ryan Adams’s Tantrum-Throwing Ability on the DeclineRobert Plant’s not crazy after all! Plus: great news for movie fans that can’t spell!